If you are a challenge only artist and not on the front page of DPW, please go here to view the answer: How do I edit, hide, or mark my Challenge Entry as sold? As you know, marking your paintings as sold, when they are not or no longer available, is an act of kindness to your buyers. If you have your PayPal Checkout set up correctly then DPW will mark your work as sold, paid, and bring in the buyer’s information from PayPal, when you sell through DPW auctions or DPW generated PayPal links. You can read how to set up your PayPal Checkout here. 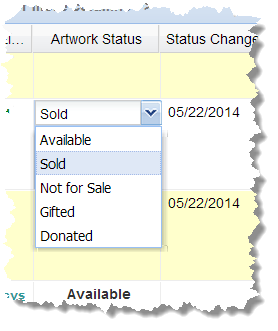 When you are logged in, you can toggle the sold status of your paintings with just a click. 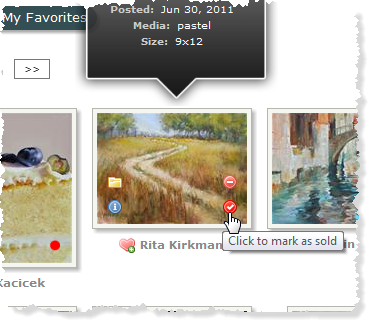 Simply mouse-over your painting and click the red dot with the check mark in the lower right to mark the painting as sold, or the red dot to mark it as available. Note: there is no need to save your edits in the Art Tracking grid since your edits are saved immediately. Posted - Tue, Mar 29, 2011 at 1:32 PM. This article has been viewed 7858 times.